Warming up…And What Makes Snowflakes the Way They Are? More sun and warmer temperatures for the rest of the week. As the high pressure ridge builds in, high temperatures in the valley will reach near 60 degrees on Thursday, and will continue to rise under sunny skies into the upper 60s by Monday. Our next chance at some showers comes in just after the 7 day forecast period. Actually, some or all of the above. The shape and size of a snowflake can tell you a lot about its brief history. Take the snow pellet example. Technically called “graupel”, snow pellets form when a small snowflake falls through supercooled liquid water, similar to how hail forms. 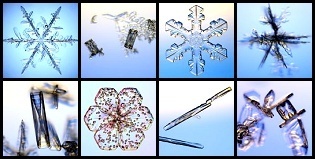 Tomorrow, I’ll tell you what factors go into the formation of other types of snowflakes.